George Oakley was taken off against Partick Thistle with a hamstring injury. 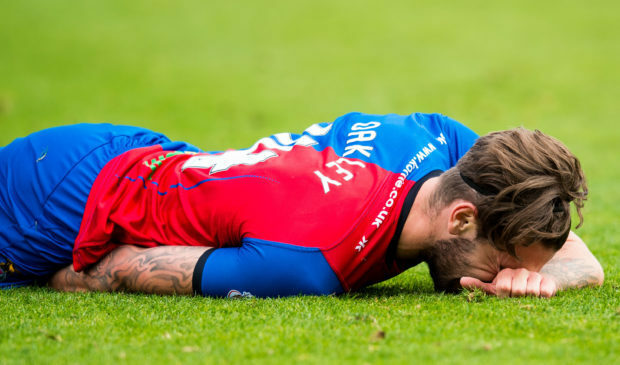 Caley Thistle have been dealt a blow ahead of tomorrow’s Highland derby trip to Ross County after forward George Oakley was ruled out for up to two months with a hamstring tear. Oakley pulled up with the injury shortly after coming on as a 69th minute substitute in last weekend’s 3-2 win over Partick Thistle, with assessments this week confirming the Englishman faces an absence of between six and eight weeks. On a brighter note for manager John Robertson, right back Shaun Rooney has trained all week following the ankle injury which forced him to be substituted during the first half against the Jags, and is in contention to play tomorrow. Robertson says the absence of Oakley, who has netted three goals this season, will be keenly felt by Caley Jags, and he said: “George has a tear to his hamstring which has also affected the tendon. “It is not just a blow for George, it is a blow for the team. He’s been doing well, coming on and scoring goals for the team. He has been starting games and doing well. “It is a blow to have him out for that period of time but we’re reasonably strong in that area. With Oakley facing a spell on the sidelines, the 22-year-old’s misfortune could pave the way for Jordan White to enjoy a sustained run in the side. White, who joined Inverness from Barrow in the summer, has started Caley Jags’ last two matches, and netted his first league goal against Thistle last weekend. Robertson added: “Jordan has had to be patient, but has come in and linked superbly well with the guys in the team. “He brings a different dimension to the team. In the last couple of games in particular, he’s led the line superbly well. “We’re happy with the way Jordan has started but we’ve others who can play the position. Caley Thistle have requested more tickets for tomorrow’s match after being handed an initial away allocation of 700, with around 4,000 tickets sold in total for the derby encounter so far.